Heat oven to 350°F. Line cookie sheet with Reynolds Parchment Paper; set aside. In large bowl, beat butter, brown sugar, eggs, vanilla and orange peel with electric mixer on medium speed, or mix with spoon. Stir in remaining cookie ingredients. On lined cookie sheet, place cookies 2 inches apart. Bake 11 to 14 minutes or until golden brown. Remove from cookie sheet to cooling rack; cool completely, about 15 minutes. In small bowl, stir powdered sugar, vanilla and enough orange juice until thin enough to drizzle. Spoon into small resealable food-storage plastic bag; cut off tiny corner of bag. Squeeze bag to drizzle icing over cookies. Ungala Gillespie from St. Petersburg, FL created this recipe for a Celebrate the Season Holiday Cookie Contest. You’ll need 1 medium orange for the grated peel in the cookie dough and the juice in the icing. 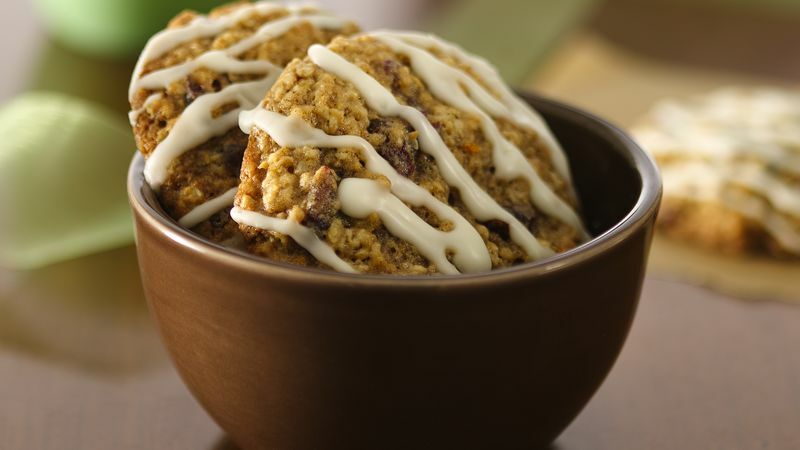 This holiday season, give your oatmeal cookies an upgrade with this recipe featuring sweet, orange icing and zesty cranberries. This recipe comes to us from Ungala Gillespie of St. Petersburg, Florida who created this recipe for the Celebrate the Season Holiday Cookie Contest. “I have always loved the texture of a hearty oatmeal cookie, and I’ve always been a fan of a chewy cookie over a crisp one. This is why I love this cookie so much. It’s tart but sweet and very chewy!” she said. If you’ve never tried swapping your raisins for cranberries, these oatmeal cranberry cookies are a must try, and Betty’s got the you need to pull off a new cookie recipe to perfection.